Bob was halfway down the center aisle before he realized what he was doing. “I guess that’s what they call being moved by the Holy Spirit,” he would later tell Pastor Judy. After the hymn was finished, the congregation sat down. With one arm around Bob’s shoulder and the other extended offering a handshake Pastor Judy said, “I offer you the hand of fellowship. We have just one question to ask you,” said the Pastor. “Do you believe that Jesus is the son of the Living God and do you affirm him as Savior of the world?” And with his “Yes” Bob became an official follower of Jesus Christ. Historically, church doctrine suggests that in order to be saved one must “accept Jesus Christ as your Lord and Savior.” That action is considered evidence of faith and according to historical church doctrine it is the entry point into salvation. Of course, most church bodies insist upon baptism and sometimes a class or other process to be assured of personal salvation. Salvation equals grace in this historical dogma. In my tradition of origin, the Christian Church (Disciples of Christ), the confession of faith is typically very similar to Bob’s experience. I was asked essentially the same question. Baptism, which comes shortly thereafter, is one of the mysteries of the faith. Yes, there is human action but in a way in which we don’t quite understand, the Holy Spirit acts. In our own United Church of Christ tradition we typically — though not always — baptize infants. Infant baptism represents a decision by parents on behalf of the child. Later, when the child is older, he or she chooses to confirm that decision. Like in my tradition of origin baptism is one of the great mysteries of the faith. God is active in baptism and confirmation. James has gotten a lot of grief from traditionalists because of his emphasis upon works. That is, he’s been accused of suggesting that we earn salvation not only by faith but by works. James has been accused of insisting that salvation requires more than baptism and a confession or confirmation of faith. He has been accused of suggesting there is something we must do to receive God’s loving grace. Martin Luther, perhaps the most famous of the early 16th century reformers of the church, called the Letter of James an “epistle of straw” because it did not fit with his doctrine of justification by faith alone. And, yet, I suggest that even “accepting Jesus as Lord and Savior” and insisting on baptism are works. That is, when the historical church — including Martin Luther — have insisted that we are justified by faith alone, they too are implying that we must do something to be saved, to receive salvation. Yet, in my studies of the Bible from Genesis to Revelation, I find much evidence that humanity is loved when we least deserve it and have placed ourselves at great emotional distance from the Divine. Well, there you have it. Luther and others did not make it up. James, in all his clarity, says that it is not enough to have faith. In order to receive God’s loving grace, in order to be saved, in order to receive everlasting salvation, according to James we must not only have faith, we must have works. Unfortunately for clarity’s sake, the Bible is not just James and James is not the whole Bible. Our Bible is a collection of writings by many different people. Written over the course of hundreds and hundreds and hundreds of years, our Bible reflects the experiences, beliefs, and theologies of ancient peoples. Even though those people were inspired by God, it is easy to see how they might occasionally contradict one another in nuance or emphasis. In his letters, Paul focused on grace. James focused on works. This is why prooftexting — or the practice of pulling out single verses or short passages to make a point — is fraught with risk. Prooftexting can lead to searching the Bible for verses that fit what you want it to say. It can lead to using the Bible as a weapon to convince others that you have all the answers. Alas, the Bible is a tool. It is our holy and sacred tool but it is not the literal word of God. It is ancient literature written by human beings inspired by and seeking God. It reflects their culture and their circumstance. It reflects their personal and communal experiences of the Divine. Through prayerful reading and dialogue about the text we, too, can come closer to understanding God’s will for our lives. And, so, I suggest that rather than getting embroiled in a nearly 600-year-old controversy, about whether James is as legitimate as Paul, we seek to listen to God through both the experiences of James and Paul. I suggest we approach the Bible holistically. We need the whole Bible. Prayerful interpretation of our sacred book requires a holistic approach. It also requires that we are in dialogue with one another so that we hear God rather than our own wishes. And, so, I put forth an interpretation of our passage from James that I believe places it within the context of the whole, that I believe allows it to reside side-by-side with Paul’s letters. Consider our lives of faith. And, though, our lives of faith are more of a journey than a race, I use the metaphor of a foot race. Like the sprinter or long distance runner, the first step is to be ready. Ready is recognizing that something is not right in your life and/or the world. Perhaps you realize that your accumulation of things that you thought would fill you up has left you empty. Perhaps, you carry a deep sadness with you because of a broken relationship with your brother. Perhaps, you look at the poor and unemployed in our nation who, rather than receiving help, are being villainized and you are appalled. Perhaps, you’re just not happy. Being ready is being unsettled. It is recognizing that things are not as they should be. Once you’re ready, it is time to get set. Getting Set is opening ourselves up to the Spirit and listening to God’s call on our lives. When you’re getting set you develop spiritual practices that connect you to something beyond yourself. When you’re getting set you finally decide to read the Bible daily or you finally come to Bible Study because you know our holy and sacred tool is a path to further insight. When you’re getting set you let go of things — feelings, conflicts, or anything that separates you from hearing the Divine. And when you do these things, you open up space to hear the One. Though it probably won’t happen right away, a commitment to listening always results in hearing. Finally, when you’re getting set you make a confession or confirmation of faith. 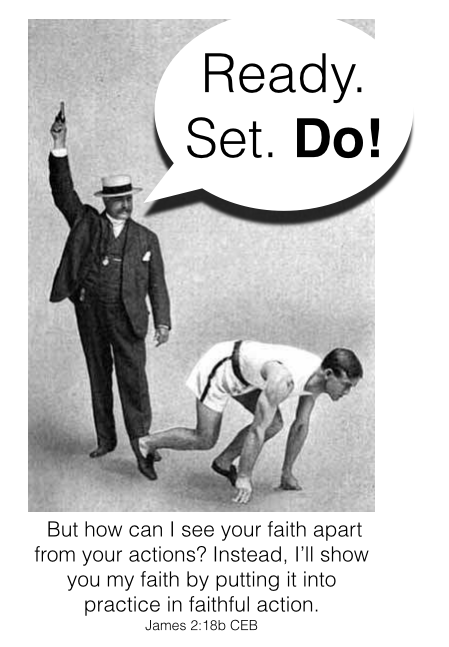 You do this either formally or doctrinally or maybe you reaffirm the faith you committed to so long ago. This is the spot at which Luther and others have argued that salvation and God’s grace begins. Respectfully, I suggest that God’s presence doesn’t wait until we’re getting set. God love always surrounds us. When viewed through parts of the Bible as diverse as the books of Job, Ruth, Judges, and Luke, I perceive a God who is always present. Sometimes our “Ready” stage is the Holy Spirit pointing out to us that the world or our lives are not quite right. Jesus was not a selfish savior. Our father who art in heaven. Hallowed be thy name, thy kingdom come on earth as it is in heaven. And so once we’ve opened ourselves to the divine and accepted God’s love, we are changed. To be open to the Divine is to feel compelled to do. Do. Doing is responding to God’s love in our lives by living in a new way. When we do, we can’t accept racism, or any other “ism” for that matter, in our midst. We call others out for it. We seek to build the beloved community in which all people are valued. When we do, we work for marriage equality, or stewardship of the planet because the image of God within us cannot be contained. When we do, we are generous. We give of our time, our talent, and our resources. We even find joy in a baby shower for folks we will never know. Though it is easier to buy a Snickers and coffee at the market when we have a chocolate or caffeine craving, we eat and drink only slave-free and fair trade chocolate and coffees. When we snap at someone, we go back to them and apologize. We are different when we’re doing. That mystery that I said happens when we are baptized? It changes us. It matters. And, so I think, that when James gets bitter about those who were oppressing others and claiming to be followers of Jesus, he is suggesting that our faith is not faith if it doesn’t show in some way. He’s suggesting that the behaviors he is observing are inconsistent with the teachings of Christ. The apostle Paul did the same thing in his letters when necessary. The prophets themselves called folks out for behavior contrary to God’s expectations. In terms of the Ready-Set-DO process? We’re never really done. This is where the foot race metaphor breaks down. We can run through it over and over again. We are human after all. The Good News is we have the opportunity to run and re-run the foot race. We have the opportunity to keep trying. Grace is ever-present. God’s extravagant love belongs to everyone. We don’t have to accept that love to be loved. But when we get even a hint at the wideness of God’s love and mercy, we are transformed. As Pastor Judy lowered him beneath the water saying,“I baptize you in the name of the Creator, the Son, and the Holy Spirit,” Bob felt the Holy Spirit come over him. For days, he’d just smile for no apparent reason. Even the guys at work noticed and said something. They were right. He felt different. He was different and because of God’s love he acted differently. How could he not? I shared this sermon with the Condon United Church of Christ on Sunday, May 25, 2014. The text for the sermon is James 2:14-26.